The “I Am Not Your…” board was part of the programming of the University of Redlands’ DUDES Week, held on the last week of November dedicated to addressing a multitude of social issues within the spectrum of Men and Masculinity. DUDES stands for Dudes Understanding Diversity and Ending Stereotypes and is a group that provides support for students who are looking for a brave space to talk about men’s issues regarding masculinity, media, gender roles, current events, etc. The public board served as an empowering and eye-opening experience for participants and observers alike. The goal was simple—to talk about struggles that are taboo on this campus and place them in your face. The board’s goal was to be loud for you—so loud that even if you don’t wish to participate in the writing of your own struggles, you can’t help but see others’ hardships. DUDES Week then moved to the more light-hearted Fashion Walk. A long red carpet, music, cameras, words of encouragement and affirmation—and, of course, fashion. Here, the runway was an open place of gender neutrality and fashion as a tool for self-empowerment. There was no “you walk like a girl” or “you dress like a boy” during this Fashion Walk. It was simply you and your attire. All bodies doing the same thing. All being accepted, celebrated and loved. 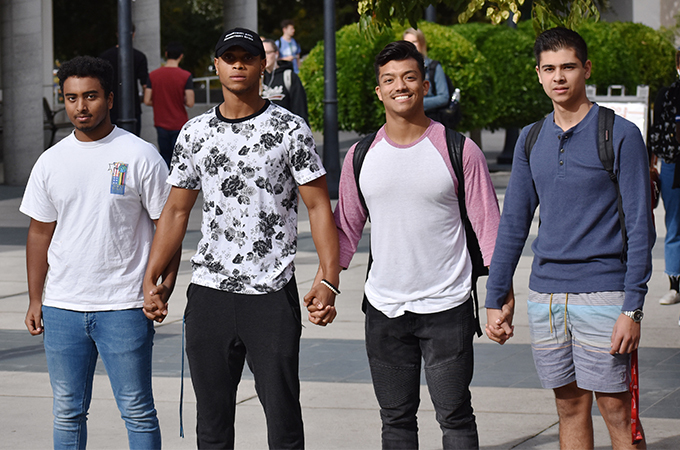 In an effort to further break down direct barriers of masculinity through physical touch and intimacy amongst men, participants walked by the cafeteria and were asked to hold hands openly with each other as their picture was taken—which unexpectedly led to a group sharing their bonds and standing in solidarity. The DUDES program has continued to bloom in dynamic ways, and this year’s DUDES Week displayed this growth. Not only were there more participants in each event than in the past, but they reached a broader audience of students. The participation of athletes, students of a multitude of majors, club leaders, Johnston Center for Integrative Studies students, and more led to a rare sense of multiculturalism—all in the power of social equity and all in the belief of never being silent. We are louder than ever and will continue to be loud.